1. Should I Call My Insurance Company First? Not necessarily. Many people think they need to contact their insurance company before contacting a roofing provider. However, a roofing expert can tell you whether or not you meet the eligibility requirements to file a claim. If you’re not eligible, there’s no point to contact your insurance company, because as soon as you report the damage, it counts as a claim even if they don’t pay out on it. 2. Do I Have to Pay to Have JKS Help Me with My Claim? No. At JKS Construction & Inspections, we offer roofing insurance claims help at no charge to our customers. We understand how challenging it can be to deal with roofing insurance companies, and we’re available to help you navigate the process from start to finish at no additional cost to you. 3. Can I Get Back the Depreciation? Yes, in many cases, homeowners can get back the depreciation that was withheld initially. However, most homeowners don’t know much about depreciation, because the insurance company never takes the time to educate them about what recoverable depreciation is — after all, if they do, they have to pay out more money. We can help you complete the paperwork needed to recover your depreciation, which could amount to thousands of dollars back. 4. The Quote JKS Provided Is Higher Than My Insurance Quote. What Gives? In some cases, your insurance company may provide a quote that is lower than our initial quote. Don’t worry — we promise to repair your roof or install a new roof according to your insurance company’s specifications and at their determined price. You won’t have to pay the difference between the two cost quotes. 5. What Happens If My Claim Is Denied? It’s not uncommon for insurance companies to initially deny a claim. We’ll help you go through an appeals process, where you resubmit your information for reconsideration. Often, homeowners are approved after they appeal. Although it can be disheartening to receive a denial letter in the mail, rest easy knowing that we’ll help you file an appeal and do everything within our power to help get your roofing insurance claim approved. Contact JKS Construction & Engineering, Inc. Today! 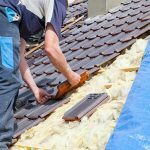 When there’s been damage to your roof, it’s important that you get it repaired as quickly as possible. Dealing with insurance companies can result in a number of delays, and the longer your roof remains damaged, the more damage can be done to your home. Contact our roofing experts today to learn how we can assist you with your insurance claim and help get the ball rolling immediately so your roof is repaired as soon as it can be. We’re dedicated to providing superior roofing service to customers in the Panhandle of Florida including: Fort Myers, Cape Coral, Estero, Naples and would be delighted to hear from you. Call now for a free estimate and help with your roofing insurance claim at 239-283-6054.